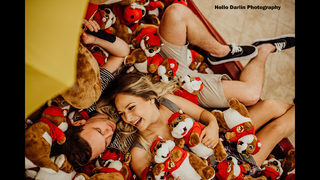 Texans love their Buc-ee's and one Katy couple decided to showcase their love with a photo shoot at a local store. Just hours after the photographer posted the pictures on social media, the sharing frenzy began. Kristina Boyd with Hello Darlin Photography wanted to do something fun and unique with a true Texas flare. Her clients Brooks Taylor and Trevor Waters are boyfriend and girlfriend. They wanted photos that would capture their love for each other. As an added bonus, the pictures also captured their love for Buc-ee's. "We have Buc-ee's and no other state has that. We thought that would be super special and different," Taylor told KPRC2. The couple has been together for about six years. She graduated from Katy Taylor High School this year, while he graduated last year. Both will be attending Lone Star College this fall. They both love Beaver Nuggets and Taylor said Buc-ee's is a mandatory stop for them on any road trip. The folks at Buc-ee's in Katy were more than happy to help out with the photo shoot. "It was a lot of fun! It was very busy. The employees were very helpful," Taylor said. So what do Taylor and Waters love most about Buc-ee's, besides the Beaver Nuggets? "Just the people and feeling welcome," Taylor said. "And of course the clean bathrooms." Boyd said the photo session has now reached more than 16,000 people. Taylor said the response has been amazing, with people telling her the shoot is "super-cute and unique."